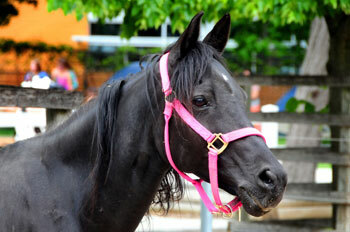 The Milwaukee County Zoo welcomes Gypsy, a black, female, Arabian horse to the Northwestern Mutual Family Farm. At 20-years-old, Gypsy is a recently retired therapy horse from Stepping Stones Farms School of Horsemanship, in Genesee, Wisconsin, where she worked as a therapy animal to help at-risk teens enrolled in its equine-assisted psychotherapy program. At age 20, painful heat cycles were making it too difficult for Gypsy to give rides any longer. The Zoo is excited to have such a friendly and good-natured horse and looks forward to providing Gypsy with a great, new retirement home! Arabian horses are one of the oldest horse breeds and have existed for 4,500 years. Their bone structure is different from other breeds since Arabians have 17 ribs, five lumbar bones and 16 tail vertebrate, while other breeds have 18 ribs, six lumbar bones and 18 tail vertebrate. Having less bones than other breeds causes Arabians to have a high tail carriage. Visit Gypsy, and all of the Northwestern Mutual Family Farm animals daily.